Steel toed boots are awesome, but let’s face it: they aren’t the best option for every profession. Outwardly, it’s hard to differentiate between the two kinds of boots, but the toe in composite toe boots is generally made of plastic, Kevlar aramid fiber, carbon fiber, or a combination of these, to reinforce the front of the boot and to provide strong protection to the front of the foot. Jobs requiring on-site work, frequent travel, or heavy lifting can often endanger your feet. All it takes is a little slip up and you have a serious injury on your hands- or feet, as it is. This is doubly true when you’re working in high electricity output surroundings, or in construction. But where metal toed boots can pose a hindrance, good quality composite toed boots will come to your rescue. Your boots need to be comfortable, roomy, well designed, insulated, and most of all, meet ASNI standards. 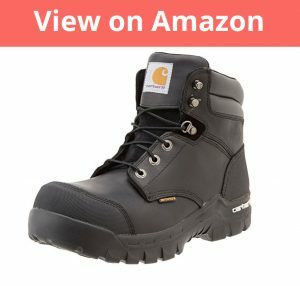 So how do you find the most comfortable composite toe boots for you? Well, you can start with this tally of the best boots on the market! The Timberland PRO Men’s 6 Inch Boondock is the big daddy of composite toe workboots. The Timberland brand itself is synonymous with good quality and durable gear. This particular set of work boots are made from imported leather, with a thick synthetic sole. The shaft is approximately 6″ from the arch of the boot. In front, the design puts the boot together to be completely insulated and waterproof, with a closely seamed lace-up in front, and a thick padded collar, that cushions the boot even more. The Boondock boasts a thick toe cap made of Timberland PRO rubber, which makes the boot near impenetratable, without adding too much to the weight. The toe cap is a molded rubber toe bumper, and an additional heel-guard, the Ever-Guard heel overlay, which prevents scuffing, is at the back of the boot. Another special feature of the boot is that its heel has unbelievably good grip, because of the three-quarter Goodyear welt and cement heel construction, with a rigid external heel cup to add to its stability. The sole on this shoe is a thing of wonder, with a dual density PU midsole and a cold formula TPU outsole. The entire Boondock work boot is covered in a waterproofing membrane that doubly protects the waterproofed leather and keeps the interior of the boot toasty and dry. The shoe itself has Anti-Fatigue technology, so the boot is designed to distribute the stress on the foot and reduce stress on the arches of the foot, preventing you from tiring. It is resilient and tough, with good waterproofing. It comes with wax threading, and a heel guard. It has an extremely good grip on the sole. Should be kept in a dry environment or the waterproofing effect can start to diminish. The Thorogood Men’s Composite Safety Toe work boot is a heavy duty boot that can be used for long hours on a work site. Just one look at the boots will make it apparent that this is a boot that means business. The Thorogood Men’s Composite Safety Toe work boot is made from both imported leather and synthetic leather, with a full-grain and oiled leather upper. The sole is thick rubber, and the shaft of the boot is about 7″ from the arch. The opening of the boot is wide, at 13″ around, and very roomy, enough to be used tightly laced but easy to slip in. The boots are undeniably tough. While a little more bulky than, say, a Timberland boot, the bulk is partly because of the front and side bumpers, making the boot more abrasion resistant, and to some extent protected against scratches too. The boots are not rigid, either, with a certain amount of flexibility in the make of the boot. The cap it all off (pun intended), the toe cap has is a industrial strength abrasion resistant composite safety toe (which meets ASTM F2413-11 M I/75/C/75 standards). The sole is a thick, three layered beast- a Gen Flex II dual density rubber outsole with firm grips, a compression molded EVA midsole with gel inlaid for shock absorption, and a removable EVA cushion flex insole for making the inside of the boot nice and comfortably for long periods of wearing. It has extra electrical hazard protection. The heel can become a problem for people when it’s been exposed to water for a long time. With prolonged shear stress on the back of the boot, it can separate from the rest of the boot. 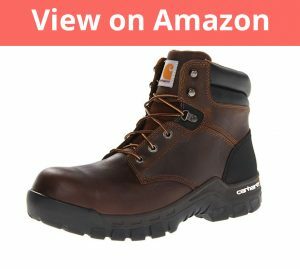 The Carhatt Men’s Composite Toe Boot is a great alternative for people looking for a sturdy work boot that doesn’t ring up too high a price. The boot is made of leather, with a thick rubber sole, and the trademark Carhartt Rugged Flex technology, which adds a lot of pliancy and flexibility to the boot. The sole of the boot boasts very good shock absorption capability, seconded by reviewers. The outsole is cement constructed and also Rugged Flex, plus very supportive to the sole and the arches of the foot. The boots are oil resistant, slip resistant, to some extent also chemical resistant. However, they are not waterproof, only water resistant. The sole is very thick, and flexible. The boot is not very rigid, and more comfortable for it. The boots are not waterproof. 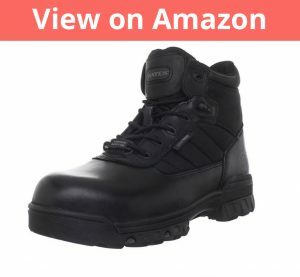 A variant of the previous Carhatt work boot, the Rugged Flex 6″ Waterproof version is, above all, waterproof, which automatically makes it more durable and more versatile in use. 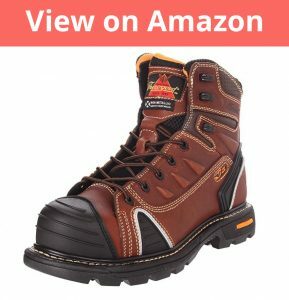 The Carhatt Rugged Flex Waterproof work boot is made of pure leather, with a waterproofing membrane covering, which makes any falling water droplets bead up and fall off. The sole of the boot is thick and made of rubber, with a composite safety toe that is up there with the best, in addition to being lightweight and roomy on the inside. It also has Ortholite insoles and a cement construction on the sole, adding to the grip and treads. The boots are also oil and chemical resistant. They are extremely easy to clean, because of the waterproofing on the outside. They have a decently tough grip, and are very good for light to moderate work. Front of boot is a little narrow. The Bates Men’s Enforcer has a name that deserves a movie of its own- and so does the boot. It is a singularly solid piece of footwear, with a blocky cut shape in front, and doubly fitted heel at the back of the boot. The boots are made of imported leather and fabric, with a heavy rubber sole. The material is very soft and convenient to wipe down, with a nylon upper on the leather boot. The toe is a non-metallic composite toe (ASTM F2413-11 standard compliant), with an inside locking YKK nylon zipper. Despite being so heavy looking, the Bates Uniform Work boots are actually very lightweight. It’s one of the reasons that they’re so commonly used by police and security personnel. The boots also have shock absorbing pads lined inside, to cushion the foot and make it more easy to wear for longer hours. The material inside has a moisture wicking mesh, which keeps the inside of the boot dry. Are reportedly not the best fit for people with wider feet. 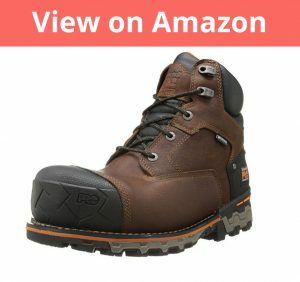 10 Most Comfortable Work Boots & Best Work Boots 2018 - Comfort and Support are Key!